Those of you who know me will know that I do have an association with Annabel Karmel. My number one daughter Biba (the bunny collector) is on the cover of her Spring Bookazine and she is also on the packaging of her Chicken Noodle World Foods dish (available in Sainsbury's and Waitrose). 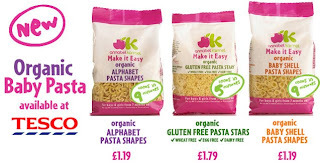 However all that aside I would like to share with you her new Make it Easy baby pasta range. You all know that my kids aren't babies anymore but they love her organic alphabet shapes. Mine are a particularly fussy bunch and would never eat a vegetable if they had any idea that they were eating it! I make up a big batch of hidden veg sauce and add the alphabet pasta. It is such good quality that it doesn't go sloppy and they love it with meatballs, sausages - or even on toast. I freeze my sauce in batches and it makes a super quick but nutritious meal that is ready in less than 10 mins. Perfect if you are in a rush - as we always seem to be. This week I even managed to get some broccoli past them. Biba - "This sauce is delicious mum"
Me - "You are eating broccoli!"